Nirwana Bali Golf Club has a green fee that is very well-maintained and manicured, all of it for the comfort of the golfers who will use this facility. With a very friendly service from the staff and golf caddies will always accompany during play at the Bali Golf nirvana. Nirwana Bali Golf also has Club house there is providing a casual dining restaurant, a fully stocked pro shop and luxurious locker rooms. Nirwana Bali Golf Club is one of the most desirable by golfers, with sea views from a dramatic Indian Ocean make this place very suitable to be used as the primary choice by the golfer. Nirwana Bali Golf Club offers a challenge to golfers derived prestigious of all skill levels. Nirwana Bali Golf Club was designed by a very famous golfer in the world, he is GREG NORMAN to design an 18-hole golf course makes it increasingly challenging to try. Coupled with the three holes located along the edge of the cliffs and terraced rice paddies makes this place unique for golfers. This place has tested the accuracy and consistency by PGA professional who makes the Nirwana Bali Golf into a fun place for the average golfer. Nirwana Bali Golf is located in one of the hotel which is very famous in Bali. It is located very close to one of the attractions of Tanah Lot about 45 minutes drive from Ngurah Rai airport. Your dress code at the golf course! Tailored trousers or shorts are required. T-shirt with collar and sleeves is required and must be worn inside the trousers or shorts at all times. Mock neck golf shirts are permitted. Tailored shorts with side pockets are permitted. Golf shirts or blouses are required. Golf trousers, 3/4 length "Capri" trousers, shorts or skirts are required. Ladies round neck golf T-shirts are permitted. Golf shoes with soft spikes or flat-soled training shoes are required. Socks are required. The Club reserves the right to refuse access to the golf course and practice facilities or to anyone it considers being inappropriately dressed. Appropriate golf attire is required for all players as noted above. Play ability. Golfers may be asked to show a handicap certificate or proficiency card prior play. All players must have passed a proficiency/test before being allowed on the golf course. Each player must have their own bag and set of golf clubs. 4 players maximum per flight. No individual or group may bring food or beverage on to golf course property. All Food and Beverages must be purchased through Nirwana Bali Golf Club. 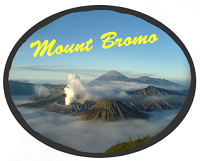 Mount Bromo or Gunung Bromo is the massif area is one of the most visited tourist attractions in East Java. The Komodo dragon, also known as the Komodo monitor, is a large species of lizard found in the Indonesian islands.